Many views of Soviet heavy armor in the West arise from myths or failure to understand Soviet military concepts. The creation of the heavy self-propelled howitzers armed with 152mm weapons is such a case. The Soviets decided early on to have two basic classes of guns – light to medium high velocity weapons for general purposes, and medium to heavy howitzers for destruction of objects such as buildings, bridges, pillboxes or other “engineer works”. While these were initially 45mm and 76mm weapons, after the initial foray into Finland the numbers changed to 76mm and 152mm. The initial solution was the KV s Bol’shoy Bashni or what became the KV-2. It was armed with a 152mm howitzer and was successfully tested in flattening pillboxes on the Mannerheim Line. But it was too tall and unbalanced, and while over 200 were eventually produced, between their unbalanced design and the poor design of the KV chassis they soon broke down and were mostly lost due to mechanical problems. The solution at the time was a low, casemate design which was tried with various weapons arrangements. With the appearance of the KV-1s, a much more mechanically refined version of the awkward KV chassis, the combination of the casemate on the KV-1s chassis was a natural evolution. With the prototypes dubbed KV-14, the new design was tested in mid 1942 and at the end of the year it entered production as the SU-152. 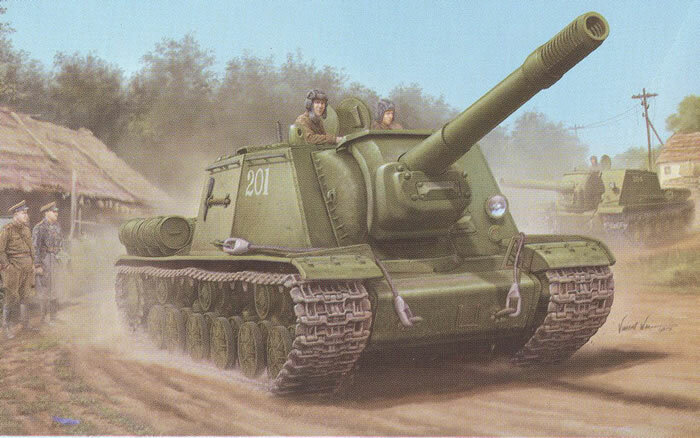 Changing over in September 1943 to the improved ISU-152 design, a total of 670 had been built. These served (albeit in dwindling numbers) through the end of the war. While designed to destroy fixed objects, the SU-152 was found to be a deadly antitank weapon due to the simple law of physics: mass times velocity equals energy. While the ML-20 howitzer was not a high velocity weapon - its maximum muzzle velocity with an armor-piercing (or concrete breaking) projectile was only 1,970 feet per second (600 mps) the fact it was firing a 95 pound projectile (43 kg) made up for many sins. In 1945 famed Soviet tank commander Dmitriy Loza noted that an SU-152 firing such a round at a Panther at 100 meters sheared the entire turret off the tank (along with the unfortunate turret crew). It soon received the nickname “Zverboy” – beast fighter – from the troops. Some years ago (1999) Eastern Express released a kit of an early production SU-152 using their KV-1s parts. It was not too bad for the time but suffered from some design problems and poor tracks. Now Trumpeter has released a nice new state-of-the-art kit of a late production version of the “Zverboy” and it is a really good effort. Trumpeter came up with a great system of “building blocks” for its KV series tank kits (which are still the best KVs on the market) and has adapted it to the KV-1s series of tanks. These have a different hull profile and running gear, and as such Trumpeter has changed to match. The kits are based on a common lower hull pan, common running gear, and common engine deck details. But they change out the turret or casemate, hull sides, and detail fittings to match their specific kit. It also comes with a new set of single link tracks instead of the choice with the earlier kits of either black vinyl single runs or “link and length” styrene tracks. Based on Neil Stokes’ outstanding KV history (“KV Technical History and Variants”, Air Connection, 2010) the model is a near dead-on match for the September 1943 final production variant. (The main difference between “early” and “late” are the addition of ventilators and a loading port in the hull sides between the tracks.) Assembly follows previous KV kits with the hull pan and attached sides. A choice is offered between either a styrene air deflector at the rear of the hull (WC28) or a six-piece etched brass one, with an etched brass screen provided for the rear cowl. Note that the hull needs modification from the KV-1s configuration and is called out in the directions. Oddly enough, while Trumpeter provides the deflector louvers for the radiator air intakes they still provide only solid styrene grilles for them (WC22). Assembly is pretty straightforward until the tracks. Trumpeter, like many other companies, does do research but often makes mistakes. Here is one of them. Initially the KV-1s was to use a purpose designed track (based on cutting weight, as the KV-1s shaved more than five metric tons from the weight of the KV-1) 608mm in width. This had triangular end sections when you examine photos. But these tracks were apparently inferior, and so what Chelyabinsk did was replace them with a 650mm track using “split links”. These links were half-links, based on the premise that a complete flat link from other tracks could be used to extend the track by more than 300mm (e.g. 950+) for use in very soft ground or snow. Both the toothed and toothless links had squared-off ends like the original KV tracks. These initially had a slight rise (“bump”) where the guide tooth had been, and later no bumps; Diagrams exist that show the split link/full link arrangement fitted but very few photos of the tracks being used in that manner. Trumpeter provides a lovely set of split link tracks - but unfortunately used the 700m track width of the KV-1 instead of the 650mm width of the KV-1s. Both tracks look very similar (other than the split link/toothless ones when seen from the running side). The result is that the tracks are just under 1.5mm too wide. While purists have complained about this error, somehow I think most modelers will simply live with it. Note that as they are A/B links you must install them in pairs (e.g. no odd numbers). The fender braces on the model are all PE and require careful bending and fitting; no plastic option is given and unless you have an old Eastern Express kit to rob you must use them. But they are slotted and tabbed to provide a bit more “foot” for cement. The model has a wealth of small details such as lifting eyes and “desant” handrails, as well as nicely engineered 90 liter auxiliary fuel tanks with solid ends that solve the problem of poor joints with the end lid types used by other companies. The painting and marking guide only shows a 4BO green vehicle with no markings. A small “number jungle” sheet with some token red stars is provided but again I would look to Neil’s book for more detailed finishing instructions. Overall, Trumpeter has done an excellent job on the SU-152 and the rest of the KV-1 line. Perhaps they will move on to the IS family as well? Note that I will be doing a full build article on this model for Cybermodeler.